We have made a great statistics based on official information provided by Powerball, one of the best lotteries in the world and probably the most popular in the United States. The data collected are from 18 January 2014 until 22 July 2015, a year and a half of collected data. Many of us play the lottery for the big jackpot, but you must not forget other prizes, that they have little about consolation, since they can make millionaires. In this period of time, the Powerball delivered 1660 million in big jackpots, they were 20 fat prizes awarded, being the smallest of 22 million, and the largest of 242 million dollars. On the other hand, during the same period, the prestigious Lottery gave 1244 million dollars in consolation prizes. The day more small prizes were distributed among gamblers, were 74 million dollars, and it was with the numbers 25, 11, 54, 13, 39, and Powerball 19. 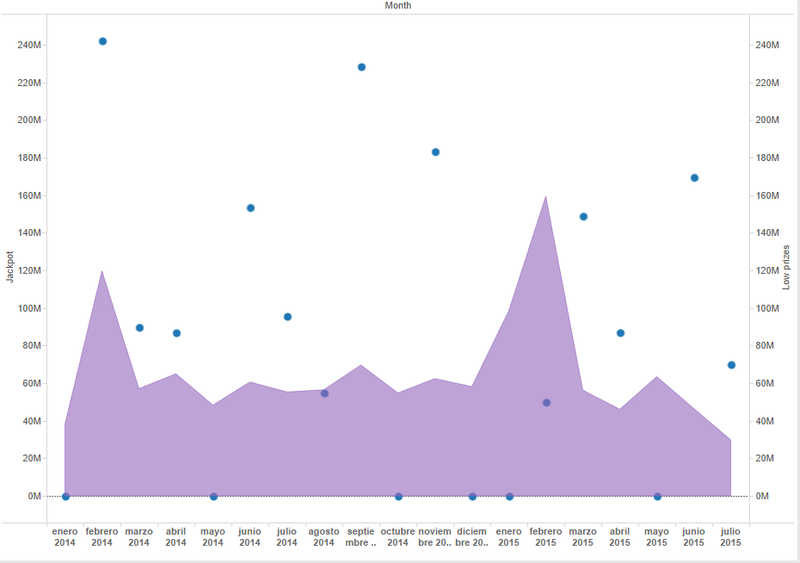 As can be seen in the graph, notice that February was the month where more consolation prizes have been delivered, both for the year 2014 year 2015. And while there is a justification for the jackpot in 2014, by 2015 is not justified since the jackpot delivered that month were about $ 50 million. Average delivered by each draw consolation prizes, is $ 7 million. This includes all the prizes, consolation, even hitting the Powerball only. Another no less regarding the Powerball ball data, is that he stands out notably that when the ball is number 19, is when more small prizes are been delivered, with over 113 million dollars, against an average of $ 35 million. And at the same time, the least of all, is the number 4 powerball, with just 2 million dollars in consolation prizes. This may be due to several factors, such as the number of times that it went as Powerball ball or the amount of bets on the draw. But the interesting thing is that month-to-month basis, the sum of prizes awarded by the Powerball lottery is steady and $ 60 million per month. This is equivalent to dozens of new millionaires every month. And you can be next.